People started popping up in a sleepy little Andalusian town after one of our favorite book ‘MEETING MONROE’ started its own journey in the world. Those who read the book, know that something happened there and now people wish to get a feeling of this. The mystery of the story and the new visitors caught the attention of (or maybe it was secretly tweeted to…) the town of Monroe, who just started realising that something happend without him knowing about it. 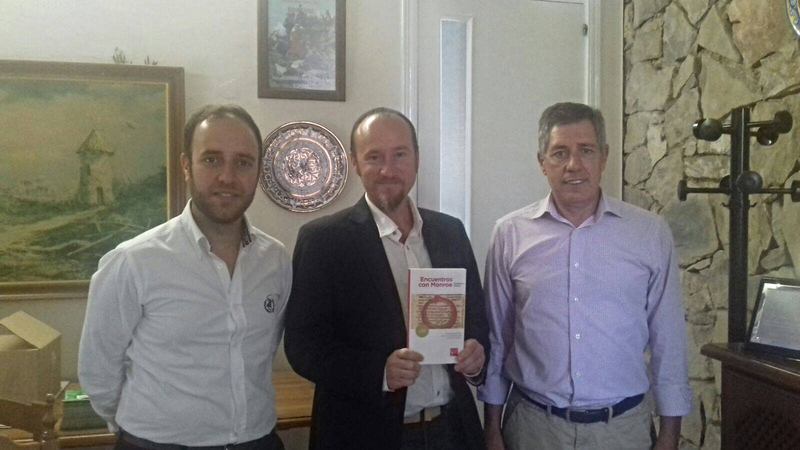 Now this had to be further investigated and rightly so, the Mayor invited Kingsley L. Dennis to have a private meeting with both the Mayor of Grazalema and the Mayor of Benamahoma (two towns in the Andalusia Sierra National Park) to present the Spanish edition of ‘Meeting Monroe’ (‘Encuentros con Monroe’). Of course many of us are aware of the fact, that the book already has been published in 5 languages (English, Spanish, Portuguese, French, and Hungarian). So this is one of the ‘secret’ why there have been a number of visitors coming to Benamahoma to explore the ‘town of Monroe’. Kingsley even gave ‘Monroe tours’ to people who have flown over to Andalusia after reading the book and wishing to visit the town … and some of them came even as far as from Brazil. So the Mayors thought it was about time they got to know who this enigmatic ‘Monroe’ is and to learn of the story and its background.